The future seemed to disappear in Eastern Europe during the years of Soviet rule. Over the decades, writers, artists and ideologists were, it seems, less and less prepared to offer clear images of the world to come. This might be of little importance, save the fact that one of the root justifications for Marxist-Leninist rule was that the One-Party-State claimed to have the practical means and the superior understanding of the forces of History to bring about a better future, that of ‘full-blown communism’. This, after all, was the utopia just over the horizon for which hardship and struggle in the present were being endured. Over time the precise nature of this state of perfection grew increasingly hazy in official futurology. This process began in the Soviet Union in the 1930s. Stalin conducted a ‘“fantasectomy” of the imagination, banning futurological art and literature in part because science fiction had been a vehicle for expressing early doubts about the possibility of utopia. The Prozac aesthetic of Socialist Realism offered insipid visions of the world to come: the predictable mises en scène of paintings and novels in the Stalin years were factories and building sites illuminated by the light of the remote ‘radiant sun’ of Communism. What existence might actually be like in this distant future was hardly suggested: perhaps its most vivid expression were the blueprints for socialist realist urban schemes and plans for leafy parks of culture and rest presented in reconstruction programme across Eastern Europe in the 1940s. Rooted in nineteenth century utopian socialism, this was a thin and rather retrospective form of futurology, particularly when compared to the cosmic dreams of the avant-garde of the 1920s. Kasimir Malevich, for instance, had imagined flying satellite towns moving freely circling the Earth and Vladimir Tatlin dedicated many years to designing the Letatlin (1929-32), a fantastic human-powered ‘air bicycle’. The poverty of Stalinist futurology was not much improved when, during the height of the Cold War, ideologists in the Soviet Union and the people’s republics adopted images of modernity furnished by the West. Khrushchev set dates by which socialism would overtake capitalism. 1980 was, for instance, identified at the Twenty-Second Congress of the Communist Party of the Soviet Union in 1961 as the red-letter year when Soviet citizen would enjoy superior living standards over their counterparts in the USA. When the future was measured in terms of refrigerators and cars, Soviet futurology lacked the motivating force which it had once perhaps possessed, even in the misery years of the 1940s. By the 1970s self-proclaimed modernisers like Edward Gierek in Poland and János Kádár in Hungary placed an overweening emphasis on the needs of present. The communist rhetoric of investment (‘work / fight / study hard today and mankind will reap the benefits tomorrow’) was traded for one of immediate reward (‘consume’). Hilton hotels in Budapest and elsewhere in the Bloc; licensing deals with Western manufacturers like FIAT and the spread of hard-currency stores selling western goods for hard currency were signs of disinvestment in the communist future. If utopianism was a spent force by the mid 1970s, when, one might wonder, was the last time it was still an article of faith, particularly on the part of Eastern European artists, architects, film-makers and writers who had once undertaken to provide images which might hasten its arrival? And, after the dreamworld of communism withered, was it still possible to practice futurology in the Eastern bloc? If the utopian vision of human happiness through technological progress had faded, what else might dreams of advanced technology be? The various nations which were corralled into a ‘Bloc’ in the late 1940s have differing histories. Nevertheless, Moscow’s influence had common effects. This was not just a reflex of authoritarian rule: Stalin’s death in 1953 and the revelations of the violence and cruelty of his regime by Nikita Khrushchev in his so called ‘Secret Speech’ of February 1956 was felt as common trauma across the Bloc. To exorcise the ghosts of Stalinist irrationalism and violence, post-Soviet authorities turned to science, technology and other ‘rational’ measures of modernisation. The Scientific Technological Revolution announced by Soviet Premier Nikolai Bulganin in July 1956 was, for instance, a programme intended to shape a new Soviet consciousness. A scientifically literate and technically expert society would be better able to conduct the Cold War competition with capitalism declared by First Secretary Khrushchev. The principal symbols of the era – space flight, atomic power and modern telecommunications – broadcast the triumphs of Soviet engineering and science to the world. Sputnik, launched in October 1957 initiated a series of ‘firsts’ in space exploration, including Yuri Gagarin’s pioneering orbit around the Earth in 1961 and the first probe on Venus, the Verena 3, four years later. Closer to home, the Soviet Union sought other spectacular achievements to renew its claims to be a force of progress. In 1959 the Soviet Ministry of Communications, for instance, commissioned a new television tower to serve the Soviet capital. Moscow’s Ostankino Tower – hub of the all-Union network, then the world’s largest broadcasting complex – was completed eight-years. Symbol and instrument, it was then the tallest structure in the world. The real achievements of Soviet science and technology were trailed by fantastic images on screen. Science fiction films – uncommissioned under Stalin – became a privileged genre again. The first post-war sci-fi movie released in the Soviet Union after Stalinism was not, however, a Soviet creation. ‘Der Schweigende Stern’ (The Silent Star) was a 1960 East German production made by the famous DEFA studios with an international cast. It was based on a short story, The Astronauts (Astronauci), by Polish writer Stanisław Lem. Internationalism was not just a way of harnessing movie-making talent: it was the theme of the film. On the screen, communism has swept the planet and mankind enjoys the benefits of nuclear technology and biological engineering. International rivalries are a thing of the past. A threat to this happy utopia comes in the form of a mysterious object that, when decoded by ‘the world’s largest computer’, seems to threaten the destruction of the Earth. A spaceship is dispatched to Venus, the source of this ‘cosmic document’. There, the international crew find the ruins of a warlike civilization that had itself already perished in a nuclear civil war. Drenched in pathos, the film’s message was unmistakable. One member of the international crew exploring the surface of Venus for signs of alien life was a French cybernetician, the creator of a chess-playing robot with a computer for a brain. In 1960 cybernetics was a new front of post-Stalinist science. Introduced to the world by American mathematician Norbert Wiener in his seminal book Cybernetics, or Control and Communication in the Animal and the Machine (1948), this science had been largely prohibited during the Stalin years. Originating in the West, it was represented as an ideological weapon which would deprive mankind of its humanity. The fact that earliest application of cybernetics by Wiener was in a feedback system used in the tracking system for US anti-aircraft gunnery lent fuel to its Soviet enemies. For exploring man-machine parallels, cybernetics was cast as a zombie science which would replace humans with docile machines. ‘The process of production realized without workers!’ screeched one Soviet critic with the pen name, ‘Materialist’. ‘Only with machines controlled by the gigantic brain of the computer! … what an enticing perspective for capitalism!’ Consequently, this adolescent science went underground with its early adepts camouflaging their interest with specialist jargon. In his 1955 novel about inter-stellar travel, The Clouds of Magellan (Obłok Magellana), Lem – for instance – substituted the term ‘mechanioristics’ for cybernetics in an unsuccessful attempt to avoid censorship. In an effort to draw real benefits from the cybernetic imaginary, experimental institutes were established throughout the Soviet Union. Science cities like Akademgorodok were initiated in the East by the Soviet Academy of Science in 1957 to explore the potential cybernetics (and exploit the enormous resources of the ‘Virgin Lands’). Populated with brilliant minds with access to the latest international scholarship, Akademgorodok was to be an accelerator of the Scientific-Technological Revolution. New computing centres and research institutes like VNIITE, the All-Union Scientific Research Institute of Industrial Design were also established across the Soviet Union. Within five years VNIITE had fifteen branches and almost two hundred design ‘laboratories’ connected to high-tech industries. Unconstrained by the requirements of the Central Plan, their number one task was to supply the nationalized industries with new prototypes for manufacture. Alongside cybernetics, ergonomics and behavioural sciences, art played a central role in many of these self-consciously experimental enterprises. Located in research institutes and off the radar of the Soviet art establishment, artist-scientists avoided the attacks on abstraction which periodically featured in official proclamations on culture. Moreover, their official status meant that they enjoyed privileged access to Western specialist publications where the work of kindred spirits like artist Nicholas Schöffer was reported. The synthesis of different technical means and art forms is [an] important side of our searches. An artist must take all the basic means that exist in nature-light-color, sound, movement (not just in time and space), scents, changing temperatures, gases and liquids, optical effects, electromagnetic fields .. .., etc. All depends on the creative fire of the individual. This sense of excitement is captured in early works like Infante’s 1963 ‘Space-Movement-Infinity’, an exercise in geometry in which a series of two-dimensional crystal forms are overlaid. Turning in an infinite space, they seem to recede to a luminous red point. Subtitled ‘Design for a Kinetic Object’, Infante developed his ‘design’ into a sculpture fashioned from revolving cubes illuminated with small lights. What its purpose might be was never made clear. By eschewing questions of application or factura, Dvizhenie’s art formed a connection back to Malevich’s Suprematism and El Lissitzky’s Prouns (artworks which were hardly accessible in the Soviet Union at the time but could be seen in the Moscow apartment of pioneering collector George Costakis). Members of the group enjoyed prominent commissions, particularly at the time of the fiftieth anniversary of the October Revolution in 1967. Nusberg designed a public light-sculpture in Leningrad to mark ‘Fifty years of Soviet Power’; whilst Infante was commissioned to create a kinetic sculpture in the ‘Exhibition of Scientific Creative Works of Youth’ in Moscow’s main exhibition grounds (VDNKh).
. “] He installed a 3m-high crystalline structure entitled Galaxy in front of the gilded Stalin-era pavilions. This kinetic sculpture was fashioned from metal struts and synthetic string (a clothes line). Electric motors animated the heart of the structure, changing its angular forms to the accompaniment of music, and at night Galaxy was illuminated with coloured lights. The piece represents the aspiration of the group to imagine new models of public sculpture for the new urban centres being planned across the Soviet Union. On the eve of a visit from senior figures in the Moscow Party hierarchy, Galaxy was the subject of an ‘ideological’ inspection. Infante and his colleagues were judged to have gone too far in their enthusiasm for the abstract beauty of geometry, and were required to dismantle the artwork. TODAY’S child is already the cosmic generation. The stars have come nearer. Then let ART draw people together through the breath of the stars! In space exploration, Dvizhenie deduced not man’s command of science but his encounter with its mysteries. 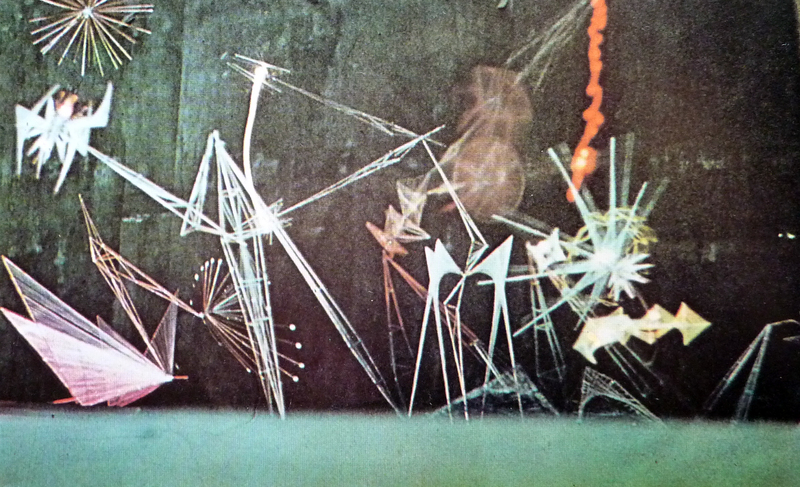 In 1966-67 Dvizhenie planned a ‘Cybertheatre’ for Leningrad, an installation which would be populated with human-scale ‘cyber-creatures’, pulsating lights and concrete sounds, cascading pools of water and vaporous gases. It is of course an aesthetic fantasy, perhaps with prophetic overtones. Is not Man himself creating more and more of his environment on the planet Earth (using matter in the same way as a sculptor uses clay for his sculptures)? We observe … the astonishing speed with which the new mythologies displace the old ones. In the intellectual life of a society in which the mechanism of tradition faith has become corroded, new myths proliferate with the greatest ease, even though they may originate in technical advances or scientific discoveries. Thousands of people fondly imagine that the friendly inhabitants of other planets will one day solve the problems from which humans cannot extricate themselves. For others the words ‘cybernetics’ embodies the hope of resolving all social conflicts. If one product of destalinisation in the USSR had been the Scientific-Technological Revolution and the formation of experimental institutes across the Bloc, another, in the People’s Republic of Poland, had been doubt. Destalinisation in the second half of the 1950s had been a traumatic affair there with artists, film makers and writers – including some of the most ardent champions of socialism – demanding autonomy from the interests of ideologues and the operations of the censor. In the years that followed, the Polish intelligentsia struck an uneasy peace with the State, sometimes enduring censorship and repression and, at others, enjoying its ‘gifts’ in the form of publishing contracts, commissions and exhibitions. An existential mood prevailed in which modernist fantasies of the autonomy of the artist and auteurisme combined uncomfortably with a growing sense of the failing modernity of Polish socialism. Kołakowski’s own writing during this period was strongly concerned with discovering the individual – an active figure, conscious of his or her actions and capable of shaping events – in the debris of Stalinism. For this man, skepticism was more valuable than faith: the needs of the present were more pressing than challenge of imagining the future. Kołakowski reprieved this theme when he reviewed the writings of novelist, futurologist and champion of cybernetics in Eastern Europe, Stanisław Lem. Already a successful novelist (whose story The Astronauts had provided the narrative of ‘Der Schweigende Stern’), Lem set out to examine cybernetics in Dialogues (1957) and the effects of as yet unknown future technologies in Summa Technologiae (1964). An influential book in Eastern Europe, Summa Technologiae was translated into Russian in 1968 and appeared in East Germany in the 1970s. In it, Lem explored the long-term trajectories of technology including cyborgization of the body with, for instance, artificial digestive-regulative systems which would allowing for adaptation to diverse cosmic environments or the use of radio communication devices as prostheses: ‘If the question of speech has to be solved “cosmically” – by continuous use of radio communication,’ wrote Lem, ‘the mouth will disappear.’ Fascinated by cybernetic concepts of communication and control, Lem announced the idea of breeding or growing information which would, one day, fill the world like swarming clouds. He also anticipated the future possibility of telepresence that he called ‘Phantomology’. Wired to the phantomat, a person would be able to enjoy any possible sensation by the neural manipulation. Indifferent to the limits set by ideology or by current science, he later described Summa Technologiae as ‘an attempt to predict what could not be predicted’. Summa Technologiae presented an image of man dissolved in technology. Anticipating Posthumanism, Lem sketched worlds populated with various types of genetically, and biochemically modified human beings as diverse as ‘the various kinds of ants’. His concept of ‘Phantomology’ disturbed all the conventional metaphysics of humanism: a mind could be stimulated into the perception of being somewhere else or multiple individuals could be networked to a single brain. In the same spirit, Lem also accused other science fiction writers and film-makers of anthropocentrism by imagining the cosmos populated with human-like beings and earth-like landscapes. His 1961 novel Solaris (famously made into a movie by Andrei Tarkovsky in 1972) deals with that possibility that other forms of intelligence may be radically alien to the humans who encounter them. Kołakowski wrote a long response to Summa Technologiae. Celebrating Lem’s imagination, the philosopher was nevertheless sharply critical. He called the futurologist ‘a ‘leading ideologist of scientific technocracy’ and accused him of trading in fantasies. Adapting Merleau Ponty’s question ‘What has remained of philosophy in the wake of the encroachments of modern science?’ Kołakowski supplied his own answer – ‘nothing’. In other words, Lem was too wired to technology to ask deep questions of existence or, for that matter, immediate ones about the present: ‘I think that consideration of intergalactic transport can profitable even in our world where real dreams lead us to conjure up actual technologies ’wrote Kołakowski. ‘One day humanity will invent telephones with which you can call Pruszków from Warsaw easily, build an elevator which will work for weeks without breaking down, as well as glue suitable for gluing and razors suitable for shaving.’ These were real problems. Although perhaps few grasped it at the time, Summa Technologiaehad inoculatory approach to progress: Lem’s hyperfuturism was an inoculation against technocracy, whether in Soviet stripes or any other kind. One contemporary who seemed to share a similar viewpoint was Polish artist Krzysztof Wodiczko. At the end of the 1960s Wodiczko began producing cybernetic artworks which shared Lem’s critical perspective on technocratic rationalism and anthropocentrism. These artworks – that he called ‘products’ – included ‘Personal Instrument’ (1969), an electronic device worn on the head and hands. Wodiczko made this work whilst working as a designer for Unitra, the main state electronics conglomerate in Warsaw. Responding to the movements of the wearer, the Personal Instrument allowed the individual to amplify or diminish the flow of sound from the environment. A sensor on the glove turned the hand into a microphone. Headphones privatised the experience. In wearing it, the user excluded himself or herself from the collective (Wodiczko specified that the ‘Personal Instrument’ was ‘for the exclusive use of the artist which created it’). 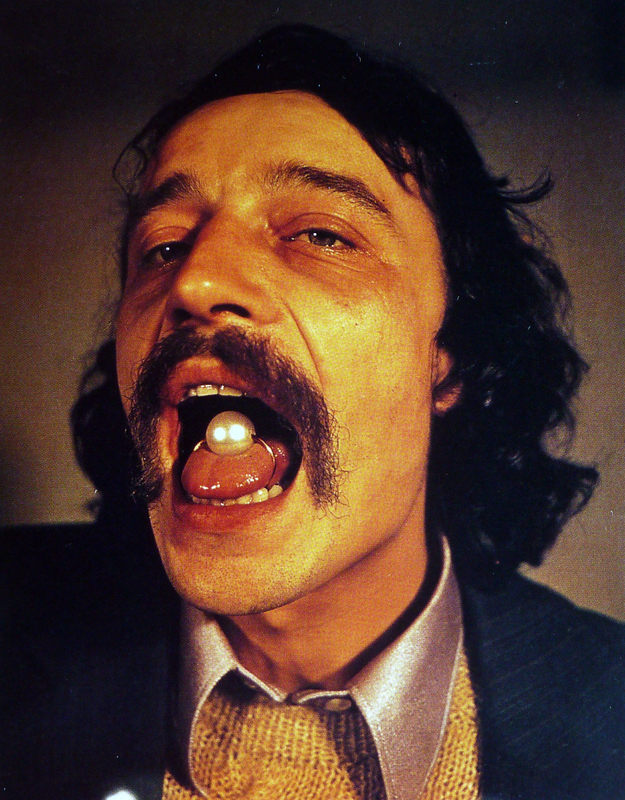 Here was a materialisation of Lem’s vision of the mouth replaced by radio. An allegorical device alluding to surveillance and anomie in the People’s Republic, the Personal Instrument was not anti-modern but it was critical. In its futurism, it pointed – perhaps darkly – to a world where the voice was no longer a human faculty. Others saw different promises in technology. At the end of the 1960s Jerzy Rosołowicz in Wrocław, Poland, promoted his concept of the Neutrdrom. This was to be a 100m-high inverted cone set on an open plain, near a large town. Travelling in an elevator at the core of the tower, visitors would shoot through darkness into the dazzling luminosity of the circular platform on top of the structure. Standing on a mirror, they would be bathed in a cosmic symphony of light. Others could enter into a 35m diameter sphere rolling around the foot of the tower. Filled with light and sound, this was to be a closed universe of sensation. Due to the contemporary communications media the range of applications of conscious neutral action is unlimited, as corroborated by the exemplary peak in the domain of space travel and exploration achievements, in which all mankind has indirectly participated. The official and generally unequivocal interpretation of these exploits, summing up all the current knowledge and ability of man, allows us to hope that they will not be turned to our destruction – in spite of the fact that they have always, most virulently, have been made to do exactly that. In the Neutrdrom, the visitor would to be ‘creative man’ (czlowiek tworczy) rather than a consumer (czlowiek konsument) or user (uzytkownik), his destructive counterparts. Piotr Piotrowski has characterized Rosołowicz schemes as ‘an ironic take on the engineering utopias that are generally created with a certain “goal” in mind’. This was, after all, the age of the telecommunications tower and the satellite. But it is not certain that Rosołowicz was forcing open the disjunction between expression and meaning that characterises irony. Nor had he given up on the future. 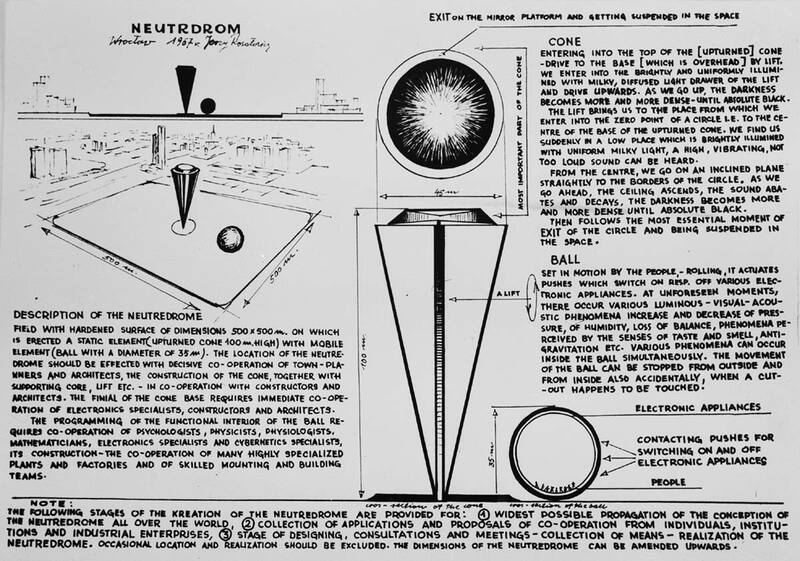 The Neutrdrom might be better understood as what Theodor Adorno called a ‘negative utopia’, i.e., a condition or experience which resists the foreclosure of the possibility of a completely new way of being. As a negative utopia, the Neutrdrom maintained an implacable opposition to the technocratic futurism on offer in the People’s Republic of Poland: anything form of compromise would have been a betrayal. In other words, the Neutrdrom ‘guaranteed’ its utopian status by being unbuildable. 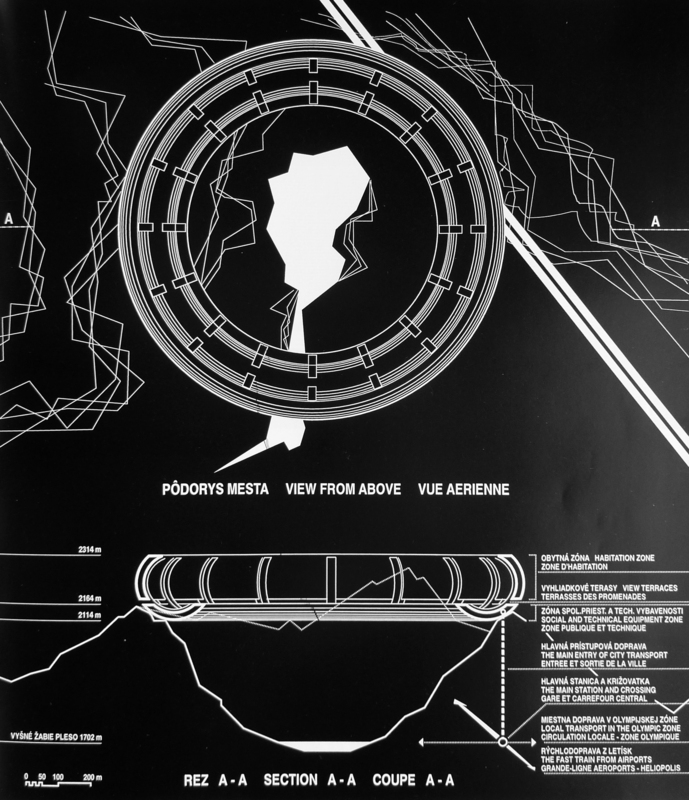 Clear intellectual and aesthetic parallels can be drawn between Rosołowicz’s Neutrdrom and the work of Slovak artist Alex Mlynarčik and architects Ľudovít Kupkovič and Viera Mecková, members of VAL (Voies et Aspectes du Lendemain/Ways and Aspects of Tomorrow), who imagined a new city perched like a bird’s nest on the tops of mountains. ”] Their Heliopolis Project, a ring-shaped megastructure at 2,150m above sea-level that could house 60,000 people, was a mechanism to protect the natural environment from its greatest threat, man. The project took shape when it was proposed to hold the Olympics in the Tatra mountains. Floating high in the peaks forming the Polish-Czechoslovak border (which only recently had been the entry point for Soviet-led forces suppressing the Prague Spring), the landscape would be left pristine below. In fact two of the six zones specified by the architects in their scheme were to be left untouched and inaccessible, a natural ‘counter-monument’ to man’s destructive capacities. Like El Lissitzky’s Prouns produced in the Soviet Union in the early 1920s, this architecture was a gesture of impossible perfection. The relationship of utopian architecture built from the dystopian logic of environmentalism was particularly provocative in the setting of the Eastern Europe in the 1960s, where to question the limits of progress was to issue a challenge to official futurology. Dvizhenie’s Cybertheatre, Rosołowicz’s Neutrdrom and VAL’s Heliopolis seem to point to an early and growing sense of environmental anxiety, one of the factors which motivated anti-communist dissent in Eastern Europe in the 1970s and 1980s. Historically, they were produced at the last moment when utopianism still had a hold on the Eastern European imagination (even if inflected as negation). Utopianism was about to be swept away in the pervasive culture of irony which was to absorb much intellectual life in the Bloc in the 1970s. As enthusiasm for the communist project faltered in the face of stagnation, corruption and the renewed censorship which marked the Brezhnev years, irony seemed like the only adequate response.In fact, utopianism itself was to become the subject of some of the most tart commentaries of communist rule. The parodies of the Stalinist ‘good life’ by Soviet Sots-artists Vitaly Komar and Alex Melamid are well known. At the beginning of their career in the USA, they also promoted ‘Super Objects — Super Comfort for Super People’ (1976), a portfolio of 36 color photographs and text panels describing impossible Soviet consumer products and devices. One product – with the brand ‘Olo’ – was tongue ring ornamented with a pearl. Only objects devoid of the dead weight of utilitarian function soar high aloft above the lowly world of daily life. The forms and dimensions of the figures we offer you are not fortuitous ones. They have been arrived at by mathematical computations that link together the dimensions of the Moon and of the human body … Buy the circles, squares and triangles manufactured solely by Renowned Artists of the Twentieth-Century Seventies, Moscow. Written just over ten years after Dvizhenie’s announcement the birth of a ‘new cosmic child’, Komar and Melamid ridiculed not only the constructivist avant-garde but also the faith of the preceding generation. For Zinovyev, the dream of cybernetic communism had become little more than an alibi for failure. Richard Stites Revolutionary dreams: utopian vision and experimental life in the Russian Revolution (Oxford, 1989) 235. David Crowley, ‘Architecture and the Image of the Future in the People’s Republic of Poland’ in The Journal of Architecture, v. 14, n. 1 (February 2009) 67-84. On this theme see various essays in David Crowley and Susan E. Reid, Pleasures in Socialism. Leisure and Luxury in the Eastern Bloc (Evanston, IL; 2010). Sonja Fritzsche, “East Germany’s Werkstatt Zukunft: Futurology and the Science Fiction Films of defa-futurum.” German Studies Revie, vol. 29, no. 2 (May 2006) 367-386. Cited in Willis H. Ware and Wade B. Holland, eds., ‘Soviet Cybernetics Technology 1959-1962’ (Rand Corporation report prepared for the US Air Force, June 1963) 11. Jane Sharp ‘The Personal Visions and Public Spaces of the Movement Group (Dvizhenie)’ in David Crowley and Jane Pavitt, eds., Cold War Modern (London, 2008) 237. Francisco Infante in conversation in Moscow, 2007. Lev Nussberg, Manifesto of Russian Kineticists (1966), as translated in Igor Golomshtok and Alexander Glezer, Soviet Art in Exile (New York, 1977)164. 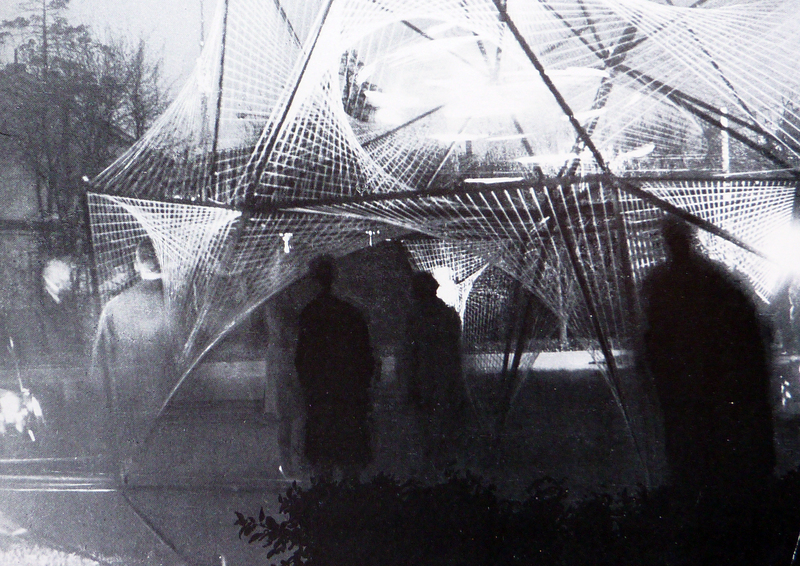 Lev Nusberg, ‘Cybertheater’ in Leonardo, Vol. 2, No. 1 (January 1969) 61-62. Michael Kandel, “Stanislaw Lem on Men and Robots,” Extrapolation 14 (1972-73) 19. Jerzy Rosołowicz, ‘On Neutral Action’ in Paweł Polit and Piotr Woźniakiewicz, ed.,s Refleksja konceptualna w sztuce polskiej. Doświadczenia dyskursu 1965-1975 (Warsaw, 1998) 230. Piotr Piotrowski, In the Shadow of Yalta. Art and the Avant-garde in Eastern Europe, 1945-1989 (London, 2009) 201. 1969 Czech sculptor Hugo Demartini pointed to the failure of utopianism, ‘overridden through technological possibilities. Inhabitants of space stations, future towns on the sea, under the ground, suspended in space, cease to be a fantasy.’ Demartini (1969) cited in Ludmila Hájková and Rostislav Švácha, ‘Where Will Live Tomorrow’ in Acke Slovo Pohyb Prostor. Experimenty v Umění Šedesátých, exh. cat. Galerie Hlavního Města Prahy (Prague 1999), p.397. Alex Mlynarčik and architects Ľudovít Kupkovič and Viera Mecková, VAL. Cesty a aspekty zajtrajsška (Zilina 1995), pp.15–25. Anatoly Vishevsky, Soviet Literary Culture in the 1970s: The Politics of Irony (Gainesville, 1993). Alexander Zinovyevm The Yawning Heights (Penguin, 1981) 519.